In order to commercialize medical devices in the European Union, a CE Mark certificate is needed. This certification verifies that a device meets all regulatory requirements for medical devices, which will soon change under the new Medical Devices Regulation (MDR 2017/745). 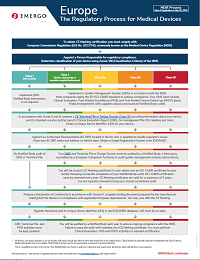 For a more detailed look at the European regulatory process for medical devices under the MDR, download the chart below.